Actually, I have been working in the Brussels museum, on invitation of Thierry Backeljau, the current curator of malacology. (a described or figured specimen, used in publication extending or correcting the knowledge of a previously defined species; Frizzel, 1933: 653). Of the ones with manuscript names two at least were undescribed species. However, of both of them only one specimen was present and the locality was rather vague. The types are stored separately in the Dautzenberg collection, which is in a separate huge room. Every type is stored in zipped bags inside transparent plastic boxes. index system. Also his personal library and his archive are still intact. This enabled me – with the help of Rose Sablon – to track the origin of the many specimens I found with labels “coll. Cousin”. Auguste Cousin was French, and lived for many years in Ecuador during the second half of the 19th century. He travelled the country extensively (presumably on horseback) and brought together a large collection. He published only once on his results (Cousin, 1887); it is one of the baseline studies for the Ecuadorian malacofauna. 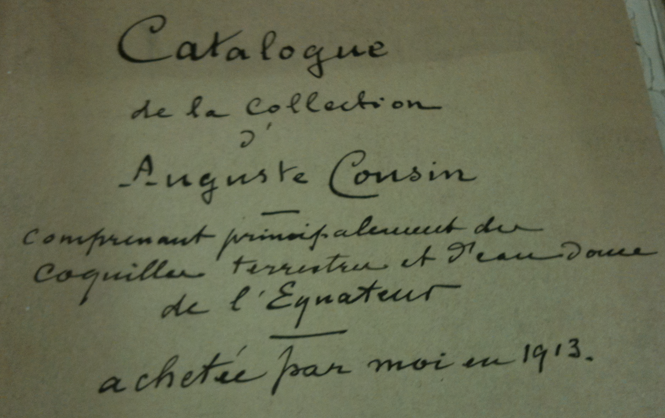 In the Dautzenberg archive we found an inventory of Cousin’s collection. As it appears, it was purchased by Dautzenberg in 1913; however it is not known from whom. Just as a guess, it could be G? ?ret, a Paris based merchant who also sold parts of the Ancey collection to Dautzenberg. Cousin, A., 1887. Faune mamalcologique de la r? ?publique de l’??quateur. – Bulletin de la Soci??t?? zoologique de France 12: 187-287. Frizzel, D.L., 1933. Terminology of types. – American Midland Naturalist 14: 637-668. This entry was posted in Uncategorized and tagged collections, cousin, dautzenberg, types on December 10, 2010 by bramb.